A 4% increase in bus and tram fares, as of today, has been announced by the Tenerife Cabildo. In the metropolitan area the increase is €1.25 to €1.30 per journey, or 0.95 with a Bono card (bus pass). An increased of 4% has also been introduced on Interurban routes throughout the island. The price of the monthly Bono ticket will remain the same, €40. 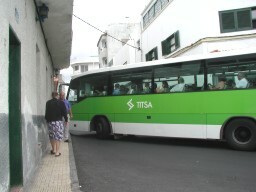 The Titsa Bus service is heavily subsidised by the Cabildo and the Canarian Government but still loses money, mostly on little used but essential outlying routes, which act as an essential lifeline to remote communities.